John Jay (June 23, 1817 – May 5, 1894) was an American lawyer and diplomat to Austria-Hungary, serving 1869-1875. He was the son of William Jay and a grandson of Chief Justice John Jay of the United States Supreme Court. Jay was active in the anti-slavery movement, elected president of the New York Young Men's Antislavery Society while still in college. He published several speeches and pamphlets on slavery and history, and was elected in 1889 as president of the American Historical Association. Jay defended numerous fugitive slaves in court and helped several gain freedom. In 1852 Jay led a team of attorneys in New York City in Lemmon v. New York, gaining the freedom of eight Virginia slaves brought to New York by their owners in transit to Texas. The ruling survived appeals through the state courts. In 1854 Jay was among the founders of the Republican Party in the United States. In 1883 he was appointed as the Republican member of the New York Civil Service Commission, founded to reduce patronage and corruption in government, and later was selected as its president. John Jay was born in 1817 in New York City to William Jay, an attorney later appointed as judge in Westchester County, and his wife Augusta McVickar Jay. The young Jay was prepared at Dr. William A. Muhlenberg's highly respected Institute at Flushing, Long Island (Class of 1832). Muhlenberg's pupils often entered higher education as third-year students then distinguished themselves further. Jay completed his degree at Columbia College in 1836, and was admitted to the bar three years later after reading the law. He early became intensely interested in the anti-slavery movement, much like his father and namesake grandfather. In 1834, while Jay was still attending college, he became president of the New York Young Men's Antislavery Society. Jay was also active in the Free Soil Party movement, presided at several of its conventions, and was once its candidate for Attorney General of New York. As an attorney in private practice in New York City, Jay represented a number of fugitive slaves in freedom suits, including George Kirk, three Brazilians, and Henry Long. He gained the freedom of Kirk and the Brazilians (who were aided in escaping by the Underground Railroad before a judge decided in their favor), but Long was returned to Virginia and slavery in 1851. Long was working in a restaurant after having been a fugitive in New York for several years. As his self-proclaimed owner John T. Smith from Richmond, Virginia sued for his return under the new Fugitive Slave Act of 1850, Horace Greeley and the American Anti-Slavery Society tried to gain Long's freedom after he was captured. This was one of several test cases of the new law. Fear of its implementation resulted in hundreds of fugitive slaves going to Canada from New York and Massachusetts, as they felt vulnerable to slave catchers. Prominent fugitives and abolitionists Ellen and William Craft migrated from Boston to England to ensure their safety. Long's case was first given to a federal commissioner, newly appointed under the law. He referred it to federal court. Despite the defense by Jay, Judge Judson found in favor of the owner. Many in New York were outraged, and 200 police were called on to enforce Long's being taken to the ferry for passage to New Jersey, where he was taken by railroad to Virginia. There he was sold to a planter from Georgia and forced to work on a cotton plantation. In 1852 Jay successfully led a team of attorneys in a freedom suit, Lemmon v. New York, gaining the release in New York City's Superior Court of eight slaves brought to New York by their Virginia owners, who were stopping over in the city prior to sailing to relocate to Texas. New York had passed a law prohibiting slave transit. Like some other free states, New York said that slaves brought voluntarily to the state by their owners in transit would be considered free. A considerable network of black and white activists kept watch for fugitive and transit slaves and took action to free them. In the case of the Lemmon slaves, activist Louis Napoleon, one of an important trio, was alerted and gained a habeas corpus writ requiring them to be presented to court. Jay, Erastus D. Culver and the young Chester A. Arthur (future president of the United States) defended them. The ruling was upheld through two levels of appeals in state courts, the second ruling made in 1860. The case was never heard by the US Supreme Court, because the civil war broke out. In 1854, Jay organized the series of popular political meetings in the Broadway Tabernacle. The next year he was prominently identified with the founding of the Republican Party. President Ulysses S. Grant appointed Jay as the United States Minister to the Austria-Hungary empire, where he served from 1869 to 1875. In 1877, Secretary of State Sherman appointed him chairman of the special commission to investigate Chester A. Arthur's administration of the New York Custom House. In 1883, Democratic Governor Grover Cleveland (later U.S. President) appointed Jay as the Republican member of the New York Civil Service Commission, of which he later became president. Jay published several speeches and pamphlets on slavery and other issues. He wrote a biographical article for Appletons' Cyclopædia of American Biography about his grandfather John Jay, Chief Justice; it included sections on his father, and himself. In 1889, he was elected as president of the American Historical Association. Eleanor Jay (1839–1921), who married Henry Grafton Chapman Jr., the president of the New York Stock Exchange, and son of abolitionist Maria Weston Chapman. William Jay (1841–1915), who married Lucie Oelrichs (1854–1931), sister of Hermann Oelrichs (husband of Theresa Fair Oelrichs), and Charles May Oelrichs (husband of Blanche de Loosey Oelrichs). John S. Jay (1842–1843), who died young. Augusta Jay (1844–1878), who married Edmund Randolph Robinson, son of prominent civil engineer Moncure Robinson. Mary Jay (1846–1916), who married William Henry Schieffelin, son of author Samuel Schieffelin. 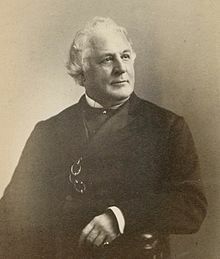 Jay died on May 5, 1894 in Manhattan at the age of 76. He was buried in John Jay Cemetery, established for his grandfather and owned by his family in Rye, New York. "The Sunday-School a Safeguard to the Republic"
"The Public School a Portal to the Civil Service." ^ a b c "IN MEMORY OF JOHN JAY; Evangelical Alliance, of Which He Was President, Honors Him. THE FRIEND OF THE COLORED MAN Eloquent Addresses by Seth Low, Edward L. Pierce, Joseph H. Choate, Chauncey Depew, and Bishop Coxe" (PDF). The New York Times. 21 November 1894. Retrieved 16 April 2019. ^ a b c Jay 1892, p. 408. ^ This article incorporates text from a publication now in the public domain: Gilman, D. C.; Peck, H. T.; Colby, F. M., eds. (1905). "Jay, John (lawyer)" . New International Encyclopedia (1st ed.). New York: Dodd, Mead. ^ Rines, George Edwin, ed. (1920). "Jay, John, American diplomatist" . Encyclopedia Americana. ^ "John Jay II - People - Department History - Office of the Historian". history.state.gov. Office of the Historian, Bureau of Public Affairs United States Department of State. Retrieved 16 April 2019. ^ "John Jay | New York Legal History / Antebellum, Civil War, & Reconstruction: 1847-1869". www.nycourts.gov. Retrieved 16 April 2019. ^ Jay, John (1892). "Jay, John" . In Wilson, J. G.; Fiske, J. (eds.). Appletons' Cyclopædia of American Biography. 3. New York: D. Appleton. p. 408. ^ a b "John Jay Homestead • The Jays at Bedford". johnjayhomestead.org. Retrieved 16 April 2019. ^ Pierce, Frederick Clifton (1901). Field Genealogy: Being the Record of All the Field Family in America, Whose Ancestors Were in this Country Prior to 1700. Emigrant Ancestors Located in Massachusetts, Rhode Island, New York, New Jersey, New Hampshire, Virginia. All Descendants of the Fields of England, Whose Ancestor, Hurbutus de la Field, was from Alsace-Lorraine. W.B. Conkey Company. p. 563. Retrieved 15 April 2019. ^ "MRS. RICHARD MORTIMER. ; Former Eleanor Jay Chapman Dies After a Long Illness". The New York Times. 10 December 1929. Retrieved 16 April 2019. ^ "MRS. WILLIAM JAY DEAD OF APOPLEXY; Widow of Distinguished Lawyer --Founded Anti-German Music League in World War". The New York Times. 30 January 1931. Retrieved 16 April 2019. ^ York, Association of the Bar of the City of New (1897). Annual Reports and Charter, Constitution, By-laws, Names of Officers, Committees, Members, Etc., Etc. Association of the Bar of the City of New York. pp. 109–110. Retrieved 16 April 2019. ^ "Mrs. Mary Jay Schieffelin" (PDF). The New York Times. 14 January 1916. Retrieved 16 April 2019. ^ "JOHN JAY'S CAREER CLOSED; END OF ONE OF THE MOST NOTABLE MEN IN AMERICA. Surrounded by His Family, He Passes Away Peacefully after a Long and Painful Illness -- He Was Ran Over in the Street in September, 1890, and the Injuries He Sustained Led to a General Breaking Up -- Was Nearly Seventy-seven Years Old" (PDF). The New York Times. 6 May 1894. Retrieved 16 April 2019. ^ "FUNERAL OF MR. JOHN JAY; PROMINENT MEN ATTEND SERVICES IN TRINITY CHAPEL. The Officiating Clergymen Were Bishop Potter, Morgan Dix, W.H. Vibbert, and Lea Luquer -- Representatives from a Number of Clubs, Societies, and Other Organizations Present -- The Body Borne to Bedford, N.Y., for Burial" (PDF). The New York Times. 9 May 1894. Retrieved 16 April 2019. This page was last edited on 16 April 2019, at 16:56 (UTC).